PUTRAJAYA: The Special Affairs Department (Jasa) has rubbished a former minister’s prediction that Malays will reject ruling coalition Barisan Nasional (BN) in the two upcoming by-elections out of unhappiness with Prime Minister Datuk Seri Najib Razak. The department’s think tank panellist, Lokman Noor Adam, condemned former prime minister Tun Dr Mahathir Mohamad and “his friends” — including Tan Sri Zainuddin Maidin, who predicted the results — for their seemingly concerted efforts to destroy the government and ensure BN’s loss in the two polls. providing ammunition for newspapers such as Harakah, Suara Keadilan and Roketkini,” said Lokman, referring to the opposition parties’ publications. He said the fuss over the goods and services tax (GST), which Zainuddin said will be a factor in the “Malay tsunami”, will die down within six months. 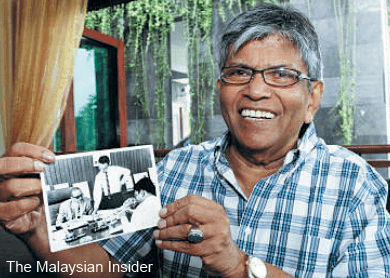 He predicted that Najib will emerge stronger after fighting through these difficult times. “BN is admittedly having difficulty explaining GST to the people, as the public’s understanding of the rising cost of goods is rather low. Yet, I believe the Malay tsunami Zainuddin mentioned will not happen,” he said. On Monday, the former information minister wrote in his blog that Najib may face a Malay tsunami in the 14th general election, given that public confidence in the prime minister is at an all-time low. Zainuddin said the coming Permatang Pauh and Rompin by-elections will be a measure of the accuracy of his prediction. He also criticised Najib over the 1Malaysia Development Bhd scandal, Putrajaya’s recent proposal to raise the age to withdraw savings from the Employees Provident Fund, fuel prices, and the repeal of the Internal Security Act. Meanwhile, on Saturday, Dr Mahathir began his roadshow to explain his criticism of Najib and the current administration. Recently, Dr Mahathir took his criticism of Najib up a notch, going beyond telling him to resign and asking Umno, of which Najib is president, to remove him or risk losing the next general election. Despite Jasa’s optimism, Muslim Youth Movement of Malaysia (Abim) president Amidi Abdul Manan did not rule out the possibility that a “Malay tsunami” could transpire.